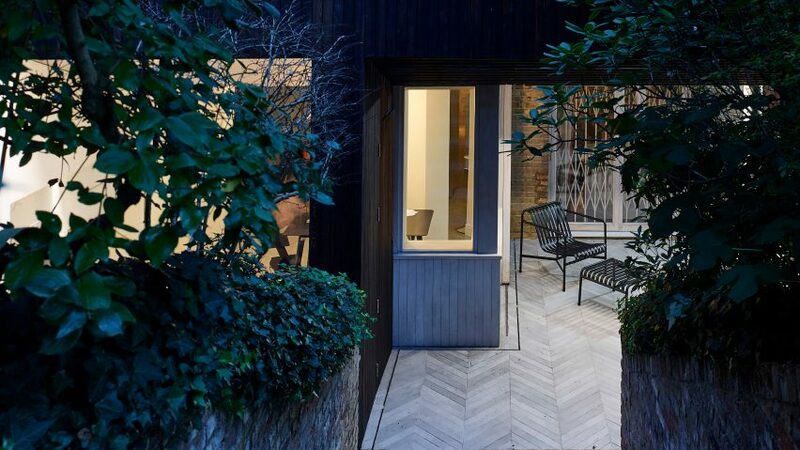 Dark timber cladding applied to the exterior of this extension to a London flat by Hayhurst and Co contrasts the white-oiled boards that line the kitchen and dining space within. 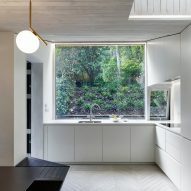 The east-London studio headed by architects Nick Hayhurst and Jonathan Nicholls was tasked with reorganising the layout of the flat in a Victorian terrace, and enhancing its connection with the garden. 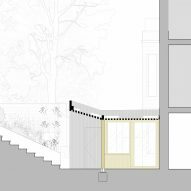 "The brief for the project was to create a timber-clad 'outdoor' room: a space that softens the threshold between the rich sylvan character of the garden and the traditional character of the Victorian rooms inside," said the architects. 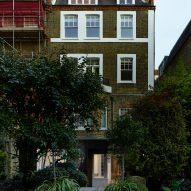 The new addition increases the internal floor area of the existing three-bedroom basement flat from 119 square metres to 136 square metres. 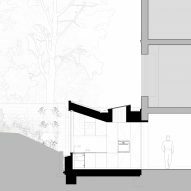 The single-storey structure extends out beyond the existing basement-level bay window to accommodate a new kitchen and dining area facing the garden. 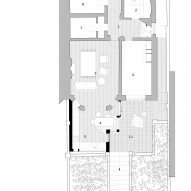 The ceiling of the compact space slants up towards the steeply sloping garden. A large window set into the end wall creates a strong visual link between interior and exterior. "The large rear picture window frames the banked garden, creating a 'landscape' view from inside the home and providing an ever-changing seasonal aspect," said the studio. The slope of the extension's ceiling is continued by a slatted pergola that creates a partially covered terrace offering privacy from the flat above. The exterior of the extension is clad in charred larch, chosen to provide a dark tone and natural texture that helps it to blend in with the garden. The wooden boards lining the new interior feature a contrasting white-oiled finish that creates a visual separation between inside and outside. 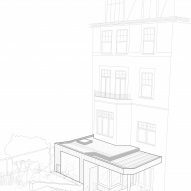 "The use of timber in this way is seen as a sustainable finish that unobtrusively sets the new extension within its landscape and provides a contemporary interpretation of the traditional conservatory." A built-in bench made from the charred wood provides seating for the dining area alongside a pair of doors that open onto the decked patio. Hayhurst and Co has previously added an extension inspired by beach houses to another London property, and designed a house and studio with a sloping roof covered in hundreds of plants for a designer couple.